It was a Friday evening ten days before Christmas in 1961. Driver Benny Kirk and his mate Fireman Ken Exton climbed onto the footplate of York-based V2 locomotive No. 60977 which had been brought to a stop on the Up Slow line near Grantham South box by the crew they were relieving. Bernard (Benny) W. Kirk was born at Denton, Lincolnshire in November 1899, where his father worked in the nearby ironstone quaries. By 1939 he was a passed fireman at Grantham, able to act as a driver but awaiting promotion which no doubt came soon afterwards. At the end of 1961 he was, therefore, one of the most experienced footplatemen at 'the Loco'. The job in hand was the final leg of a relay of footplatemen and locomotives which set off at 10.5 that morning when the train left Aberdeen. Behind the tender were 25 vans loaded with Scottish meat due to be sold on the London market the following day. It was one of the world's longest-etablished freight services, as the following extract from a book published nearly a century earlier testifies. 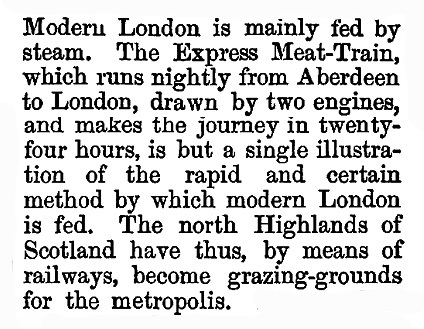 This extract from 'The Life of Thomas Telford' written by Samuel Smiles and published in 1867 illustrates how important to London's food supply was the daily supply of meat by train from Aberdeen. By 1961 the journey was accomplished in around 14 hours and double-heading was no longer required. The final 100 miles or so to the capital was a regular trip for a Grantham crew, and as the men prepared for the journey nothing out of the ordinary was expected. The train was class 'C', fully fitted with the automatic brake, so they could maintain a good speed and, because of the perishable cargo, they had priority over most other traffic. Driver Kirk and Fireman Exton set off for King's Cross Goods Depot unaware that ahead of them, as they steamed through the darkness beyond Peterborough, the stage was being set for one of the most violent multiple collisions ever to take place on the East Coast Main Line. Between Peterborough and Huntingdon two trains were travelling south on the Up Goods line, which lay to the left of the Up Main line. Both trains had been turned onto the Goods line at Conington South signal box to make way for the meat train. It was a foggy night and the second train, an Empty Coaching Stock (E.C.S.) working, was travelling too fast in the poor visibility. It ran into the rear of the preceeding goods train near the isolated and rarely occupied signal box at Wood Walton. Wreckage from the impact fouled the adjacent southbound Up Main line along which Benny Kirk and Ken Exton, on the footplate of the meat train, were approaching under clear signals - though they were still some miles away. Critically, the wreckage also obstructed the Down Main line, over to their right. Almost immediately after the rear-end collision a northbound express goods train bound for Newcastle arrived on the scene from the opposite direction. The locomotive, A3 pacific No. 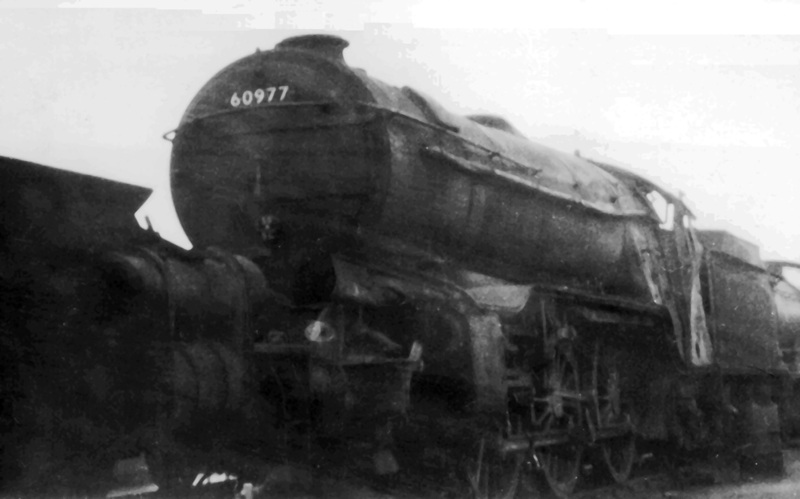 60078 Night Hawk of Gateshead, struck a derailed brake van and toppled onto its left side. Many of the 34 wagons behind it piled up across all four lines. There were ten men on site at the isolated location in the dark and fog - nine train crew and a King's Cross driver travelling as a passenger. One of them was trapped, all were shaken and they were unable to communicate with anyone, either on the railway or locally. They realised that they needed to take decisive action. With all four lines obstructed, and no-one else yet aware of the accident, only they could alert the footplate crew of any train that might still be approaching. Having realised the situation their training kicked in. They began to implement emergency procedures that, if time allowed, could prevent a bad situation becoming even worse. Driver Kirk, of the Up meat train, who was stationed at Grantham Motive Power Depot, said that all the signals at Connington South were clear for his train which was travelling at 45-50 m.p.h. A detonator was exploded and at the same time he saw the tail lamp of the E.C.S. [Empty Coaching Stock] train at, he estimated, a distance of 15-20 yards. He immediately applied the brakes and he thought that the speed of his train had been reduced to 30-35 m.p.h. when it struck the wreckage, and became derailed. Class V2 No. 60977 in Saltersgate cutting, approaching Grantham with a northbound parcels train. The driver occupies the seat from which Benny Kirk would hear the warning detonator explode as he and Ken Exton sped south that December night, on this same locomotive, towards the three wrecked trains piled across the track in front of them. Photograph by Bill Reed, Peter Tuffrey collection. No. 60977 also turned over onto its left side. 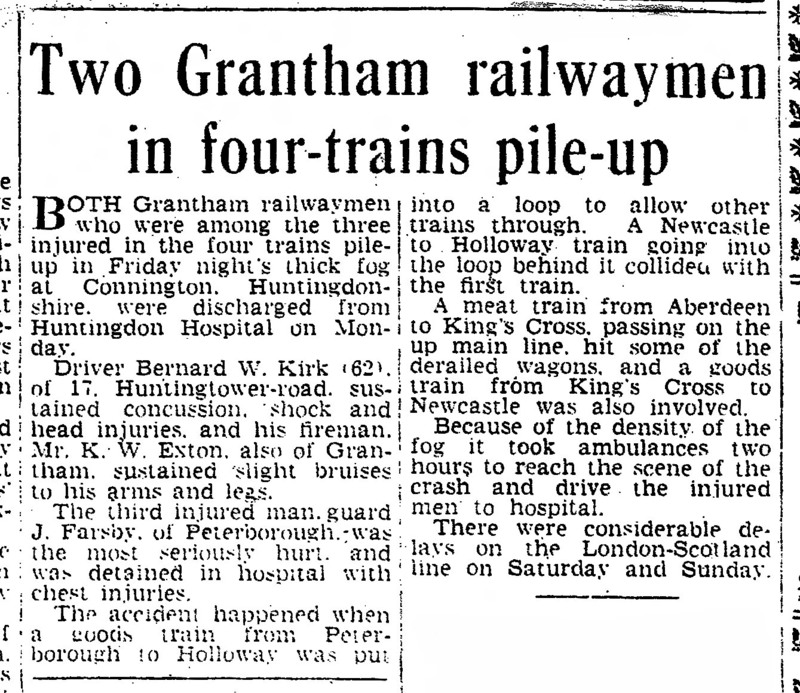 Amazingly, as the dust settled, the two Grantham men were helped from their cab - in shock certainly but, given the circumstances, relatively unhurt. When ambulances arrived they were taken to hospital and allowed home two days later. The crew of the overturned northbound A3 had been fortunate to escape injury. The most badly injured man was a goods guard. His van had been hit from behind by the E.C.S. train in the first impact, and it was then struck by No. 60078. It seems miraculous that, from an enormous pile of hundreds of tons of twisted steel and splintered wood, laced with burning coals and scalding steam and water, thirteen men - the crews of four trains plus the driver travelling as passenger - survived that dark and foggy night to tell the tale. The detonator which gave Driver Kirk sufficient warning to reduce speed was placed on the rail by Fireman Sutton of the E.C.S. train, who was walking to Conington South signal box to raise the alarm when he heard the meat train approaching. If he'd had another few minutes he would have reached a point from which Benny Kirk could have brought the meat train safely to a stand. From 'The Grantham Journal', Friday December 22nd 1961. 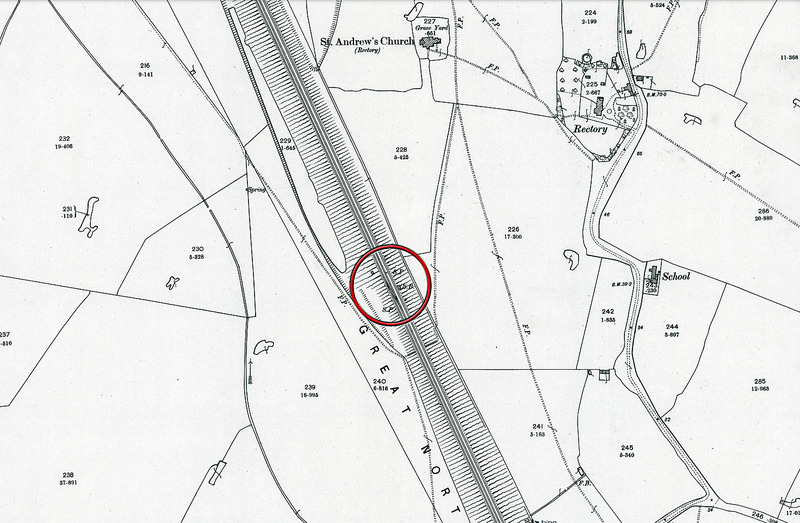 The location of Wood Walton signal box shown on a map of 1901. By 1961 there was an additional fourth track here but there was no crossover. St Andrew's Church is still prominent from the railway, though now disused. There is a photograph of A3 No. 60078 Night Hawk following the accident here. No. 60078, was repaired at Doncaster, but V2 No 60977 never turned a wheel in traffic after the accident. It was taken to Darlington, where the V2s were overhauled, and it must have been considered as beyond economic repair because Mick sent this photograph of it on the scrap line there early in 1962. Class V2 No. 60977 at Darlington waiting to be scrapped following damage sustained in the Conington accident. The photograph shows that it is one of the V2s still with the original 'monobloc' cylinder casting. For this reason it would have required the renewal of all three cylinders, even though the most serious damage was to the left side. With new diesel locomotives coming into service all the time no doubt the expense couldn't be justified. 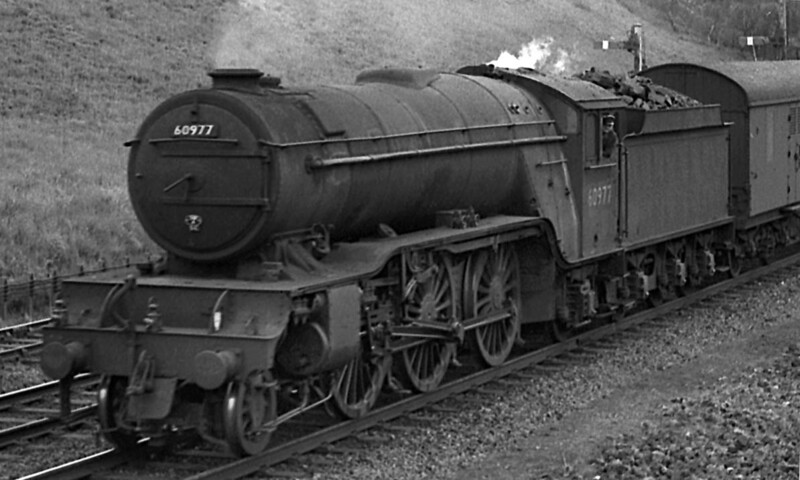 No 60977 became one of the first of the V2s to be withdrawn for scrapping. Class V2 No. 60977 in Saltersgate cutting, leaving Grantham with a southbound passenger train. 40 miles on the train would pass the spot where 60977 was to be damaged beyond repair in December 1961. 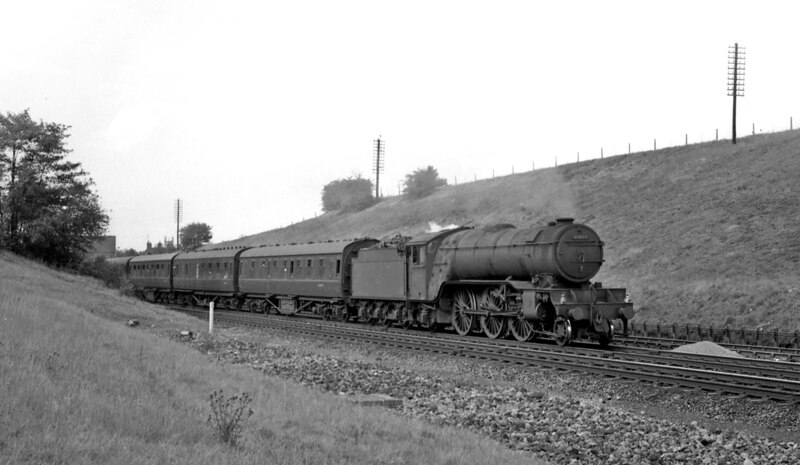 If you'd like to read more about the accident at Conington South on 15th December 1961 the Ministry of Transport's official accident report is here. An article written about the accident by Stanley Hall, Smash in Fog, was published in Steam World No. 257 (November 2008), (pages 30-35). There is a webpage about Conington South signal box here. ... and a track layout and signalling diagram said to be of about 1960 here. However it appears to represent the arrangement after the accident, the Up home signal being a shown as colour light signal capable of giving a 'call-on' aspect, which was lacking on the semaphore signal which was in place when the accident occurred. This may have contributed to the cause of the initial collision. In his report the Inspecting Officer wrote: I hope that it will be possible for the call-on signals to be provided on this section as soon as possible and in any case before next winter's fog season. In the diagram Wood Walton signal box has been replaced by Wood Walton IBS (Intermediate Block Signal).